by Carol Eaton Hevner (ed); Lillian B. Miller (au); Peter J. Parker (fr). In 1824, the year that Rembrandt Peale completed his heroic tribute to George Washington & exhibited the Patriae Pater at the Philadelphia reception for Gen. Lafayette, some other Philadelphians set about forming a Society for the purpose of elucidating the history of the State. In the following 160 years the Historical Society of Pennsylvania was filled to overflowing with the very evidence of history. 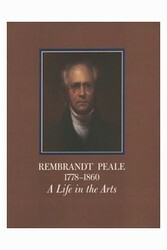 This exhibition & catalog includes a combination of Peale's paintings with his writings, evidences of his successes & of his failures, sketches the outlines of the life of an artist who lived from the Revolution to the eve of the Civil War, whose career mirrors many of the ambiguities & concerns of a maturing nation. Illustrations.